Eggs and butter, which were the chief produce of the widespread small farms, were brought to market weekly by a patient donkey harnessed to a small cart, usually driven by the farmer's wife. Since the early 1990’s, a number of these small donkeys have been imported into New Zealand, and they are now firmly established and are being bred in a number of studs. 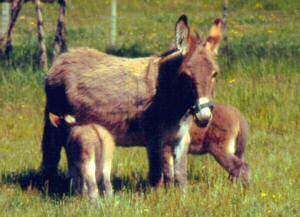 Pure English/Irish donkeys are no more than 11 hands (44 inches or 111.76 centimeters) in height, and are often referred to as “Miniatures.” They come in a variety of colors. The breed is today probably the most sought-after donkey in New Zealand.